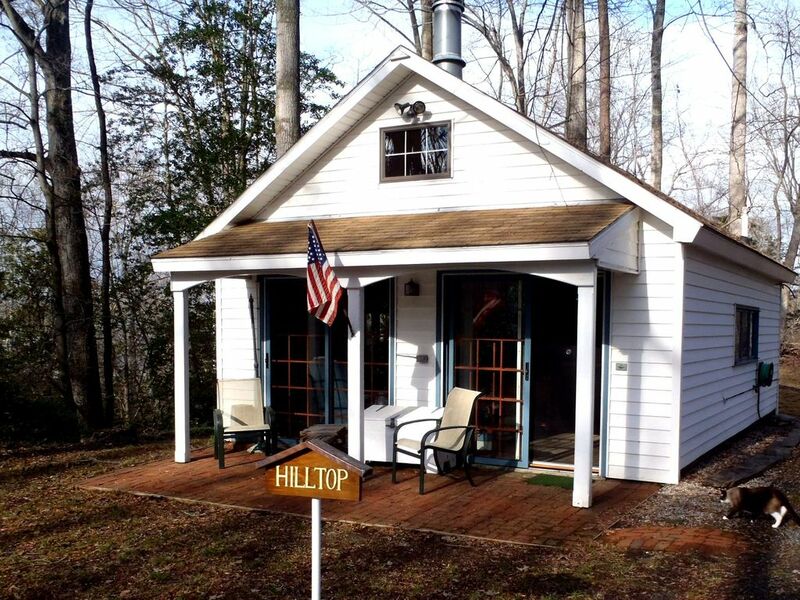 Hilltop Cottage has one loft bedroom with two twin beds. The main floor has one fullbathroom and an open floor plan with a kitchen area and a living area with sofa bed and wood stove. This small cottag eis located on a hill that overlooks St. Leonard's creek. It is fully furnished with cooking and eating utensils, books, tv (limited reception), air condition, space heaters (electric) linens included. Best for warmer weather stays. Great for walks in the woods. Two miles from the Calvert Cliffs state park; 10 minutes to Solomons Island;. Kent and Nancy Mountford are marine biologists who have lived on this 20 acre property for over 30 years. Kent is the author of several books and many newspaper columns about the Chesapeake Bay. Nancy grows orchids in her greenhouse on the property and at her nursery in the Dominican Republic. This cottage was fixed up as a guest house for friends and family and we would like to share it on a short term basis with guests who need a place to stay for a stop over type during a short job or a woodland vacation. Very quiet, private on the south side of St Leonard's creek. Watch the deer feed in the orchard field below the cottage. Close to Solomons Island, the Calvert Cliffs State park. Full tub with glass shower enclosure; linen closet with window to woods. Towels and linens included. Separate space heater for cold days. Kitchen is about half of the floor plan. New refrigerator, microwave, counter top oven, stove top gas range, all dishes and silverware and utensils included. The first floor is accessible to wheelchairs. This is a good location for someone who wants to 'disconnect' from the grid for a short time. Cellphone reception is fine, just no cable or satellite connection at this location. Cottage is located a couple hundred yards in from the public road and overlooks St. Leonard Creek. Limited access to the creek upon arrangement with owners. A good location for a short stay while working in Calvert County on temporary assignment or a quiet place to write a book. Peaceful cottage in a lovely wooded area. My experience with the cottage was great!